Delta Showers are great products. 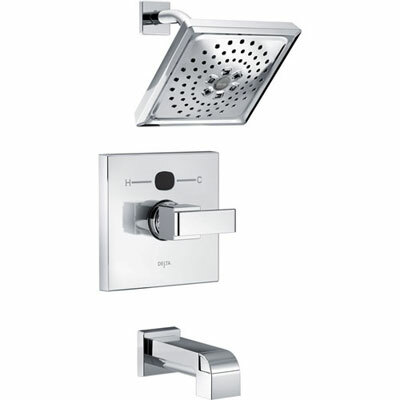 Delta offers high-end, amazing looking Shower Systems, Tub and Shower Faucets, Shower Only Faucets, Diverters, Shower Control Handles, as well as many other Shower related fixtures. 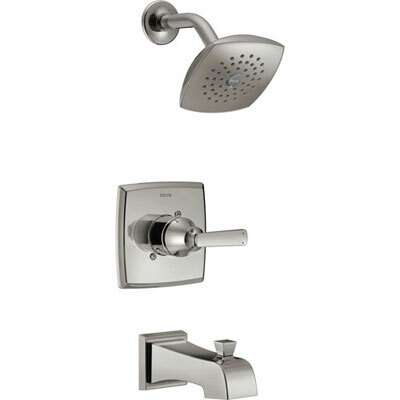 Delta Shower Faucets include a Lifetime Warranty on both the operation and the finish. They offer many different designs ranging from contemporary and modern to traditional Victorian. Part of what makes Delta great is the wide range of options they offer. 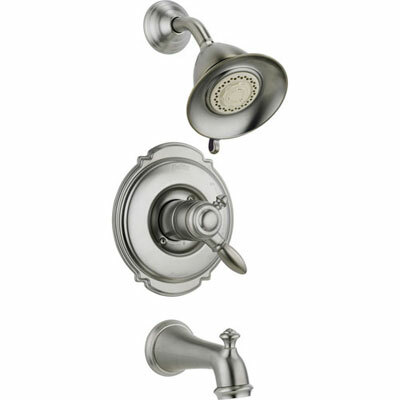 With many finishes and styles to choose from, you are sure to find the perfect Shower Fixture for your home. Using our more than 40 years of experience in the plumbing industry we have written this guide to teach you everything you ever wanted to know about Delta Showers. 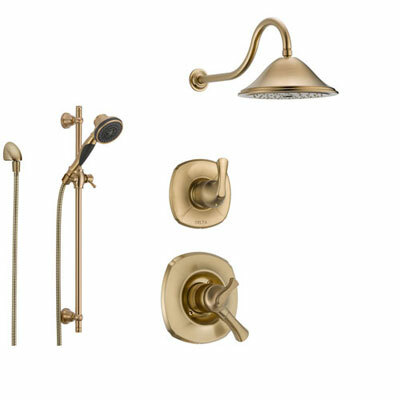 You will learn about the different components that make up a Shower and learn how purchase what you need to get yours up and running. You will learn about different functions offered by different Shower components and this will help you make an educated decision when you are ready to purchase. 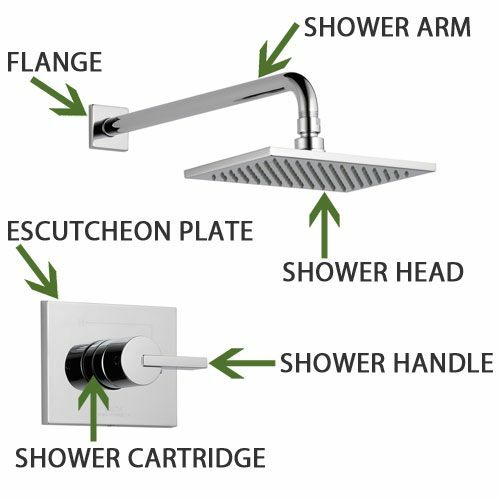 This guide is designed to explain the difference between various Delta Shower Types, Shower Valves, and Shower Cartridges. After you have read this article, you will understand how to properly select the perfect Delta Shower for you! When it comes to the specific function and installation requirements, things can get a little bit tricky with regards to installing a Shower. 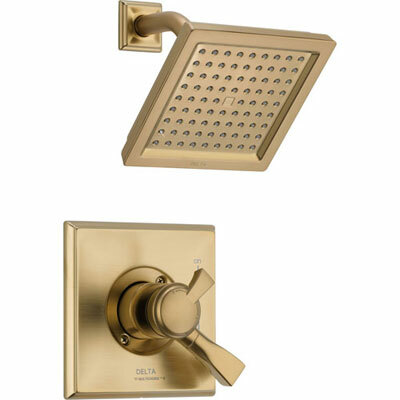 There is often confusion about the differences between the various Shower Valves, Shower Trim Kits, and Shower Cartridges offered by Delta. At FaucetList.com we have over 40 years' experience in the plumbing industry and we can help you figure out what you need. We have worked with every major brand as well as with many other less well known brands. Delta is a clear industry leader. Their products offer a ton of flexibility with regards to style and design. More importantly, they have actually manufactured their products to offer an incredible level of flexibility which can really benefit you. For years plumbers have pushed brands like Delta, not only because their products are extremely reliable, but also as the components are designed to be interchangeable, making them much easier to install and repair. As a normal person, it's likely you have never really had to think about how a shower works until you have to go purchase one. There are some fairly simple things that seem very confusing at first but with a little explanation will all make perfect sense. Delta's website helps a bit but their information is scattered around and seems to be written for professionals like us rather than end users like you. They seem to assume you already know a lot about plumbing technology and after reading through their documentation we felt it seemed a bit confusing. The goal of this article will be to try and put things in layman's terms to the best of our ability. If anything is still confusing, make sure to Contact Us for additional help. 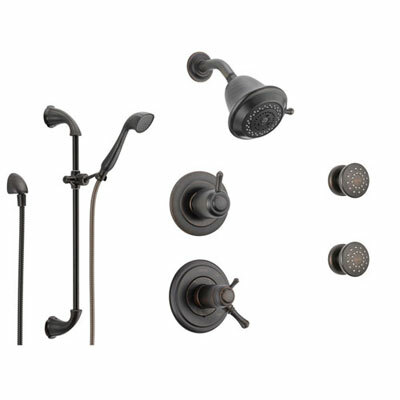 What is a Shower Faucet Trim Kit? 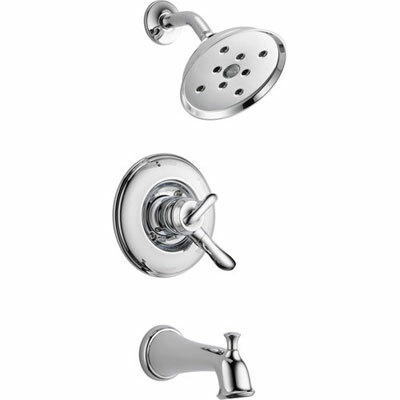 Tub/Shower Faucets typically contain two parts: The Trim Kit and the Valve. The Trim Kit is the part of the shower you see. 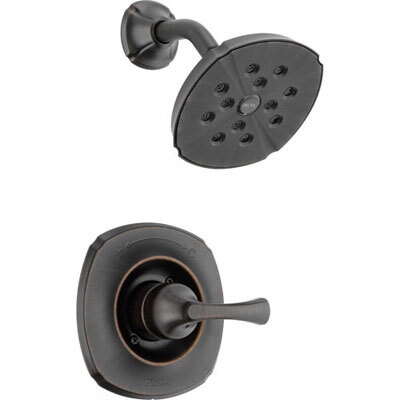 It includes the Shower Handle to turn the water on and off, the Escutcheon Plate that covers the hole in the wall, the Shower Head, the Shower Arm, and the Flange. 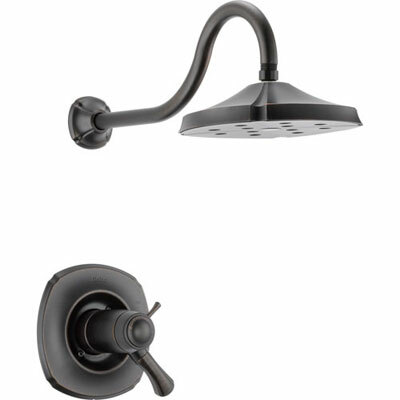 It can also include the tub spout if you are purchasing a Tub and Shower Combination Faucet. 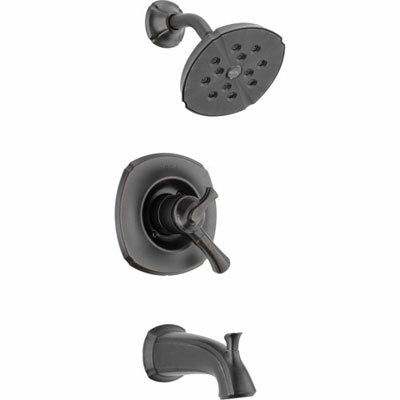 Delta Shower Faucet Trim Kits include the Shower Cartridge. Delta Trim Kits are arranged into different series based on the Cartridge they include. 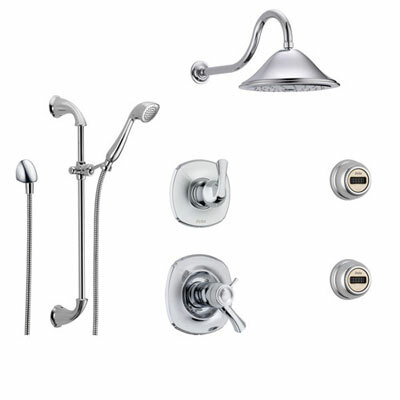 Monitor 14, Monitor 17, and Monitor 17T Series refer to differences in the Shower Cartridge included with the Trim Kit. We will be discussing the Cartridges more in detail later. 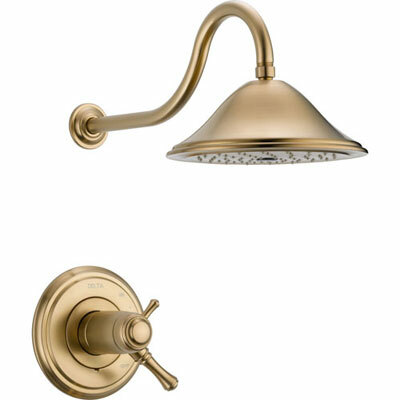 Please refer to the image on the left to learn more about the components of a Shower Faucet Trim Kit. What is a Shower Faucet Valve? The second part of a Shower Faucet is the Valve. 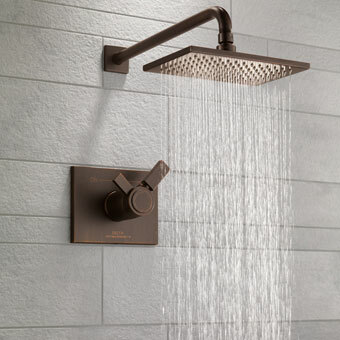 Sometimes referred to as a rough-in Valve, the Shower Valve is the part that installs in the wall and connects to the actual hot and cold water lines. The Valve is where the water from the hot and cold water lines inside your wall is mixed. Once the water has been properly mixed to a warm temperature it is ready to spray out your Shower Head for comfortable use. 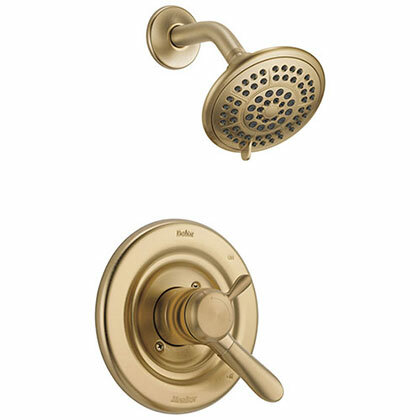 View the picture on the right to learn about the most common Universal Delta Shower Multi-Choice Valve. In the plumbing industry manufacturers typically make their Valves proprietary. This means Delta Trim Kits only fit Delta Valves. A Delta Trim Kit cannot be used with a different brand's Valve and a Delta Valve cannot be used with a different brand's Trim Kit. You may not mix and match different manufacturers as the Valve and Trim Kit are specifically designed to only fit each other when made by the same company. ***Note that on a Shower Only installation the Tub Spout Outlet will be plugged. So What's the Point of selling the Valve and Trim Kit Separately? Well it doesn't make much sense if you have a brand new construction project. 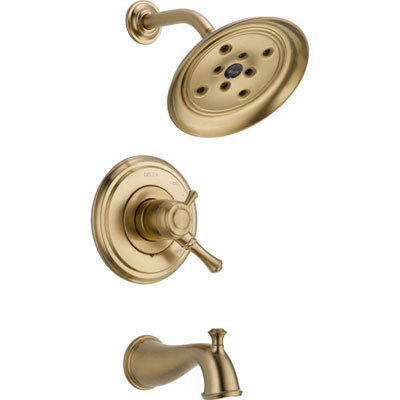 If you are building a new home, you have nothing so obviously you need both the Shower Valve and Trim Kit. If you are doing an extensive remodel where you are ripping out the walls and tile etc. you also will likely be changing things in the wall anyway so it's not such a big deal for you to change the Valve. In this case, a Shower Valve and Trim Combination is what you need. However, some people only want to change the look or function of their shower, but DO NOT want to rip out the tile and go into the wall. This is where purchasing the Trim Kit only makes sense. You don't have to pull out the inside Valve, all you need to do is change the Trim and it looks like a brand new shower! Buying a Trim Kit only works great if you ALREADY have a DELTA VALVE installed in the wall. You can save lots of money on parts and the labor needed to change them if you simply swap out the Trim Kit. 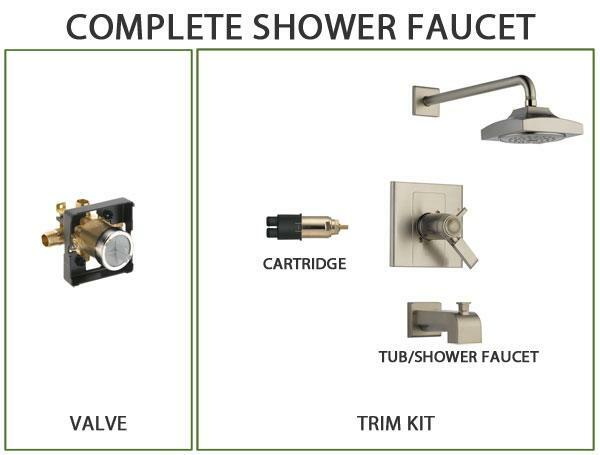 The reason for selling the Valve and Trim Kit separately is that it enables you to upgrade the look of your bathroom or change the function of your shower without having to undergo major renovations. Delta manufacturers their Shower Valves to be universal. This means you can simply remove the Trim Kit (which installs over the tile) and switch it out. This makes renovation work much faster and less expensive. As long as you are ok sticking with the Delta brand, your universal Delta rough-in Valve will fit any Delta Trim Kit. As mentioned above, this is the reason that the valves and trims made by different companies are not compatible. They do it on purpose to lock you into their brand. They know that once you have the Valve installed in the wall it will be very difficult to change. Rather than ripping out the wall and changing everything, they know it will be much cheaper and easier to just change the Trim. Therefore you will purchase another product from them rather than from a competitor. Judgement of this business practice aside, this makes it important that you choose a good product made by a good company because for better or worse, you will be kind of stuck with that brand. Ordering cheap imported showers from a no-name brand can have some pretty large consequences down the road if you ever decide to upgrade/change your shower. Remember, it's not just about style and finish. 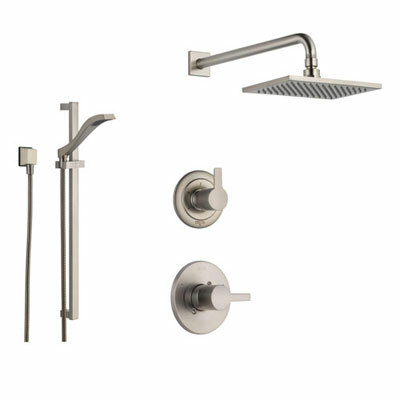 With one Delta Shower Valve you can install any of their Shower Faucet Trim Kits. You can choose from any Delta Collection. You can change from a Modern design to a Traditional one. You can choose any finish offered by Delta. You can mix and match freely. But more importantly still, Delta's Universal Valve also offers you the ability to change the actual function of your Shower. For example you can change a normal Shower to a Thermostatic Shower without having to change the valve. The same valve can be used for a Shower only Installation and a Tub Shower Combination Installation. This is because with Delta Shower Valves it is the Trim Kit that determines the function, not the Valve. This is NOT true with every manufacturer and the flexibility offered by Delta is a great benefit. The Delta Multichoice Universal Shower Valve's biggest benefit is it's flexibility. 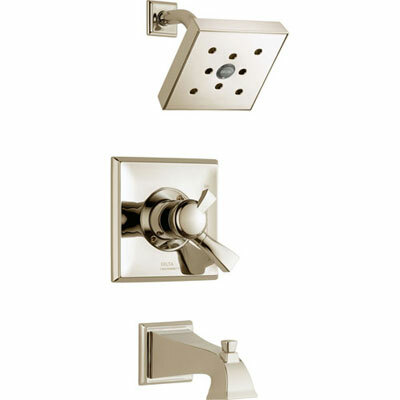 By installing the MultiChoice rough valve first, you then can decide what type of shower you want. Whether you want to control just the temperature or keep temperature and volume controls separate for maximum flexibility, it’s not a problem. If you want the security of a pressure-balance cartridge or the precise temperature control of a thermostatic cartridge, MultiChoice Universal makes it easy. And with numerous style options for all functionalities, getting what you want has never been so simple. Although Delta valves are Universal, there is some confusion as they do offer several model numbers on their website. Typically the valve you want will be R10000-UNBX or R10000-UNWS. These are the most commonly used and work for 99% of people. To be thorough in this guide however, we will outline the other valves and why you might use them. They are all universal and all Delta Shower Trim Kits will fit every single one of these valves. All Valves feature forged brass bodies and Back-to-Back installation capabilities. They can be tested with air (200PSI) or water (300PS) without valve using a supplied test cap. Square plastic guard allows for right angle cuts. For use with Single or Dual Function Trim Kits. 1/2" Outlets and connections. Note: No tub outlet in the HF model. You should use proper the fitting with each type (copper tubing, iron pipe, and pex fitting). Make sure to use proper tooling with crimping pex fitting and cold expansion pex models. IP indicates female 1/2" threaded connections. UN indicates universal type fitting and is 1/2" NPT male thread with 1/2" CWT female sweat. Lifetime warranty on parts. Delta Valves Comply with all low lead regulations. Complies with CSA B125.1 and ASME A112.18.1. What is a Shower Valve with "Stops"? The image to the left shows where you can find the shower stops in the Valve. Stops are unnecessary in some installations but make a lot of sense for others. Basically stops allow you to shut off the water to that specific Shower Valve but leave the water on in the rest of the house. This means if you ever need to change your Shower Trim Kit or repair a problem with that Shower Valve you will not have to shut off the water to your entire home. The stops act as a shut-off for that specific fixture. So if you have a single family home and shutting off the water for a few hours is no big deal, shower valve stops are basically unnecessary. 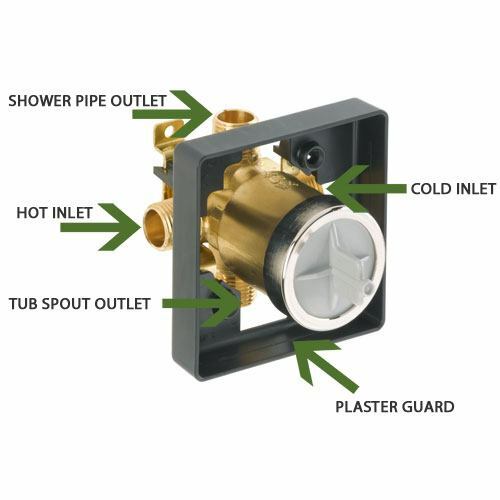 If however you are installing your Delta Shower in a multi-family complex like an apartment building where it would be difficult to get the building water shut off, a Shower Valve with Stops can save you a lot of hassle. Stops are a simple open and close valve operated by a standard screw driver. Turning them shuts off the flow of water to the Shower Valve, allowing you to detach the Trim Kit or switch out a leaky cartridge. Once you have the Universal Valve you can select any Trim Kit. 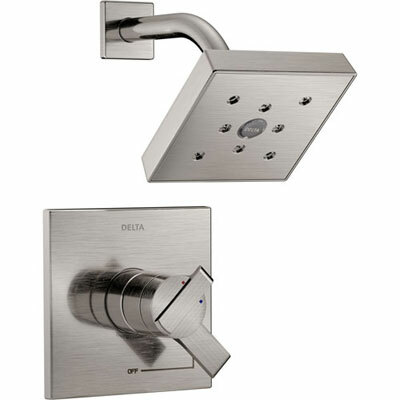 Delta's Universal Shower Valve can even be used as a base for a full Delta Shower System. 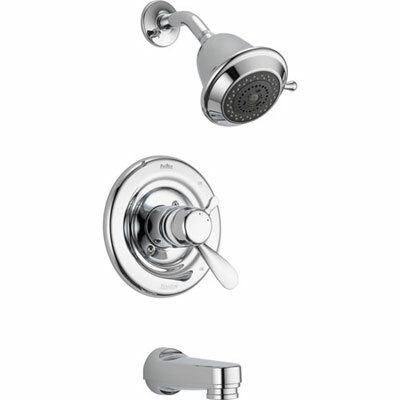 Different functions you can use the Universal Valve for are Tub and Shower Faucet Combinations, Shower Only Faucets, and Shower Handle Controls. 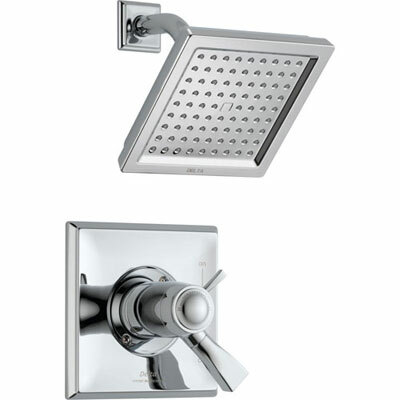 Additionally you may want to consider incorporating a Diverter into your Shower Design. 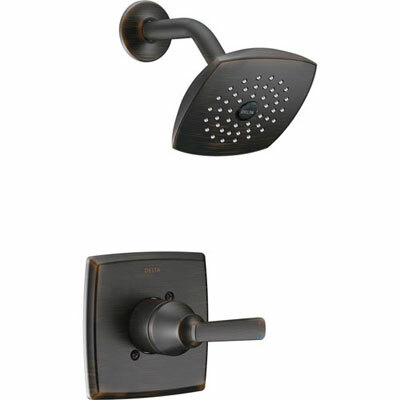 Diverters USE A DIFFERENT VALVE from normal Shower fixtures as their function is different. Diverter valves do not mix water like a normal Shower Valve. They diverter already mixed water take in from the normal valve and send it to the peripheral shower systems (eg. Showerheads, Handheld Showers, or Body Sprays. The diverter valves are however all compatible with each and every style of Delta Diverter. 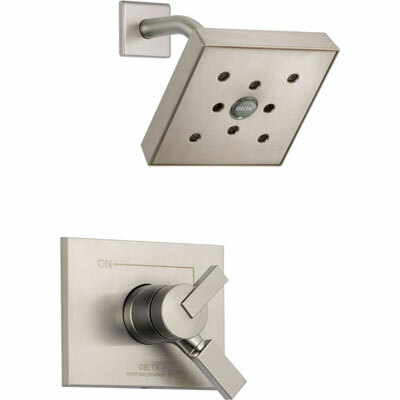 Diverters are primarily used for when you want more than one spray option for your shower. For more information see: How to Build a Custom Shower System. If you want a more simple and less expensive solution, read more about our Easy Install Shower Systems. 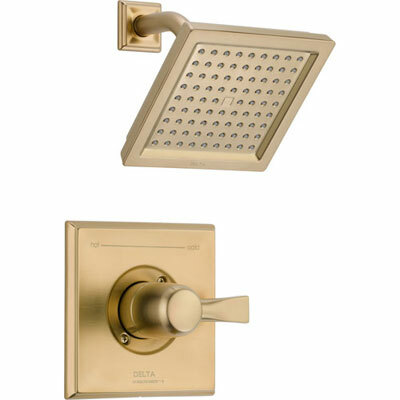 A particular specialty of the Delta brand are their complete custom shower systems. Delta makes some of the best custom shower systems on the market today. Although it may seem a little complicated at first, Delta makes it easy to build your own shower system. Their modular design lets you to easily configure your system in thousands of different ways! 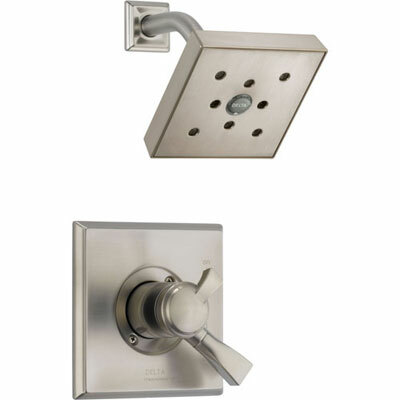 The basic principle of a shower system is that you get more spray outlets than a normal shower faucet. Rather than just a single showerhead, a shower system can have multiple shower heads, hand shower sprayers, body sprays, or even a ceiling mount rain showerhead. These additional spray outlets are not just for looks. They add amazing functionality and allow you to re-imagine what a shower can be. Whether you have a new construction project or are doing a complete bathroom remodel / renovation, take a moment to consider adding a full custom shower system. While the walls are open it's a lot easier to run all the necessary piping. Once they are closed up and tiled over it will be a long time before you'll get another easy opportunity to install a full body shower system. Custom shower systems are a great addition to any master bathroom! Get a spa style shower in the comfort of your own home! 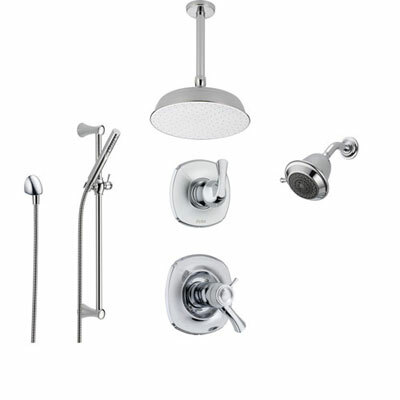 At FaucetList.com we make buying a shower system easy. 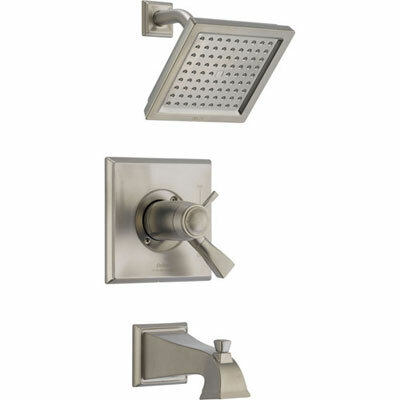 We have literally thousands of pre-built shower systems ready for immediate shipment. Our systems are optimized with water pressure in mind and include all fixtures, handles, cartridges, and rough-in valves required for installation. Shower systems make waking up every morning easy! Be sure to take a look at all the great styles we have to offer. In addition to the different types of Showers discussed above, you also need to consider the Cartridge. Delta's universal Valve design requires that the cartridge take on a larger role. The Cartridge will even affect overall water output. The cartridge can assist in raising your Shower's water pressure. 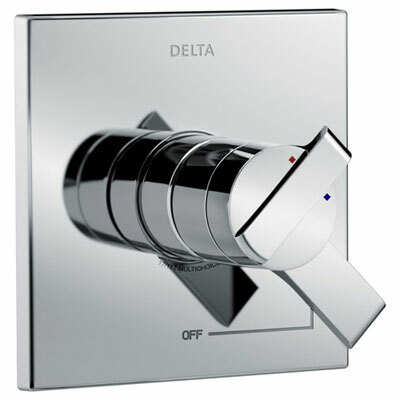 Delta also makes cartridges that allow you to control the temperature and volume output of water separately. Their most high-end cartridge is the Thermostatic cartridge (Tempassure) which automatically adjusts the water mixture to maintain precise temperature control. There are 3 Cartridges offered by Delta. The Cartridge is INCLUDED WITH THE TRIM KIT. When selecting a trim kit, make sure to consider the cartridge that comes with it so you will fully understand the features offered. So what is the difference between the Cartridges? First you have to understand that ultimately the roll of the cartridge is to allow you to turn on the water using the handle and to control the flow of water from the valve up to the Shower Head. 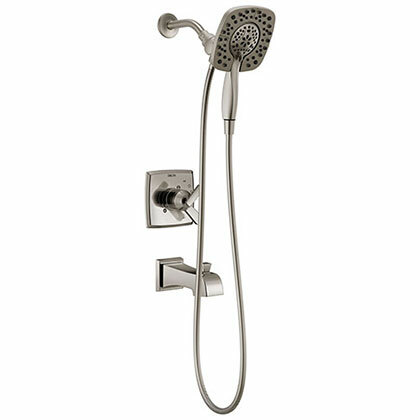 The cartridge also controls the flow of water from the valve and out through the Shower Head. 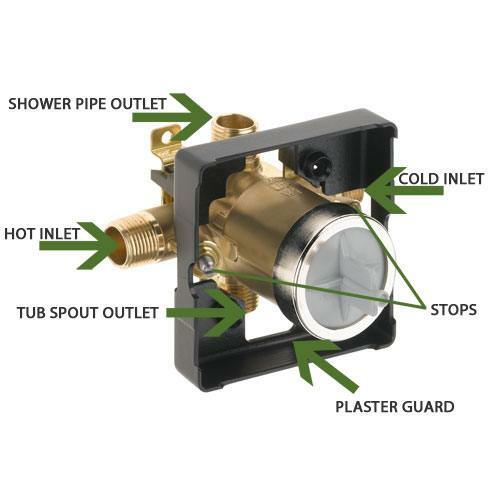 If you are putting together a Full Custom Shower System, it is recommended you choose a Trim Kit with a 17T Tempassure cartridge as these put out the most water. For normal use of just a Showerhead or a Tub and Shower combo, all the cartridges are fine, but there are some slight differences between them. This item your standard normal cartridge. At 80 PSI it puts out 7.96 gallons of water per minute. This cartridge functions as a single control for temperature only. As you rotate the handle the water comes on and as you turn it counter-clockwise, the water gets warmer. 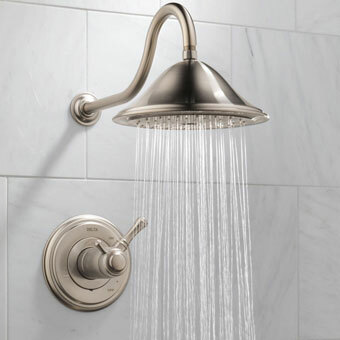 You do not have independent control over the amount of water volume that comes out of your showerhead. Consistent temperature (+/- 3.6 degrees F) is achieved by balancing the pressure of both the hot and cold water. This cartridge is offered with all Monitor 13 and Monitor 14 Series Delta Tub/Showers. 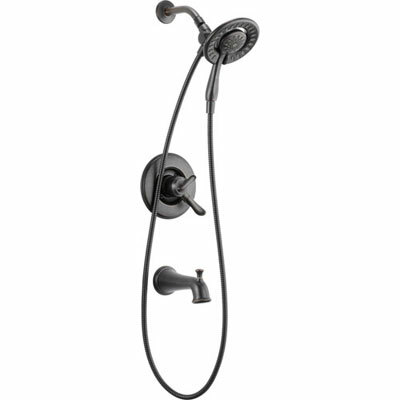 This item adds another level of functionality to your Shower. This cartridge allows the user to control the temperature and volume of water independently. The temperature can be set in order to remain consistent shower after shower but can also be adjusted as desired. Constant temperature (+/- 3.6 degrees F) is achieved by balancing the pressures of both the hot and cold water. 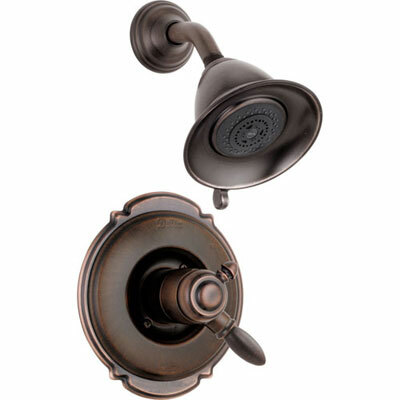 Dual function cartridges come in all Monitor 17 Series Delta Tub/Showers. This cartridges allows for water flow of 6.98 gallons per minute at 80 PSI. These are the most high-end cartridges offered by Delta. They put out 8.53 gallons of water per minute at 80 PSI. 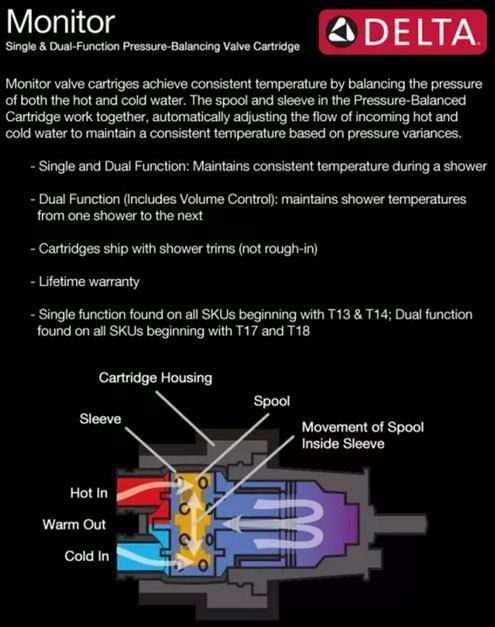 The Thermostatic Shower Valve cartridge is Delta's newest innovation, designed to keep water temperature consistent (+/- 3 degrees F) by measuring and monitoring the temperature of the water and then automatically adjusted the water mix to maintain a more precise water temperature. This cartridge also offers separate temperature and volume control. The temperature can be set to remain constant shower after shower. It is easily adjustable if desired. Thermostatic cartridges come in all Tempassure 17T Series Delta tub/showers. So after reading the descriptions above, you may be thinking that the second and third options on the list seem awfully similar. They are quite similar but the Tempassure technology definitely offers a more luxurious shower experience. As noted above, the 8.53 GPM of the Tempassure cartridge is quite a bit more than the 6.98 GPM of the standard Dual-Function. 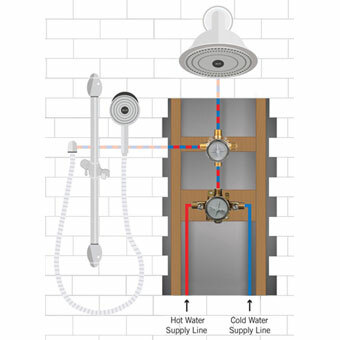 If you are creating a Custom Shower System and want to power several Shower Sprays off of one valve, the higher water pressure can make all the difference. For more, read our in-depth explanation of the difference between the Delta Monitor 17 Series and 17T TempAssure Shower Trim Cartridges. Tempassure technology also keeps the water within a slightly stricter range - 3 degrees vs. 3.6 degrees. That may not seem like a lot but it is actually a 20% difference, making for a fairly decent bump in the accuracy of control. The Tempassure cartridge also features an adjustable high-temperature limit stop that when properly set helps ensure the handle cannot be turned to a position that is too hot for comfort. Because the Tempassure actually measures the temperature of the water, the handle limit stop will not need to be adjusted for seasonal ground water temperature changes. When you are shopping for different cartridges, you need to pay attention to the series number of the Delta Shower Trim Kit. The Delta 1300 and 1400 Series Trim Kits include the single function cartridge. The Delta 1700 Series Trim Kits include the Dual-Function Cartridge. The 17T Series Trim Kits all come with the Dual-Function Thermostatic Valve Cartridge. Remember from before, ALL TRIM KITS USE THE SAME VALVE. This information should help illustrate just how many variations can be delivered from the same rough-in valve. This is a huge benefit to the Delta brand. The point of the Monitor technology is that it prevents sudden and possibly unsafe changes in shower water temperature. In the old days, flushing a toilet or turning on the washing machine might change the water temperature if someone is taking a shower at the same time. Delta Monitor Faucets are designed to avert these problems. Delta Monitor faucets feature pressure balance valves to keep water temperature in a safe +/- 3 degrees Fahrenheit range. This protects you from sudden changes in hot or cold water pressure. Monitor Faucets feature Anti-scald technology which prevents you from being burned by hot water should a change in water temperature occur. In fact, most local building codes these days require Showers to be Anti-scald in new home construction. 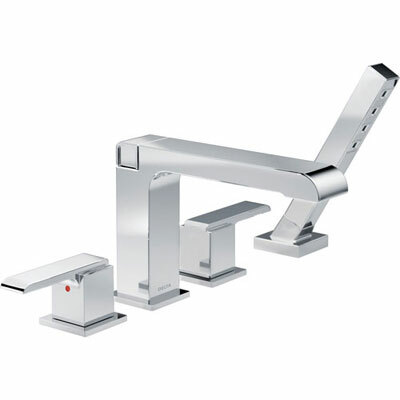 Monitor Faucets also feature an adjustable high-temperature limit stop that when properly set helps ensure the handle cannot be turned to a position that is too hot for comfort. This however may require seasonal adjustment unless you have a 17T series thermostatic cartridge trim kit. 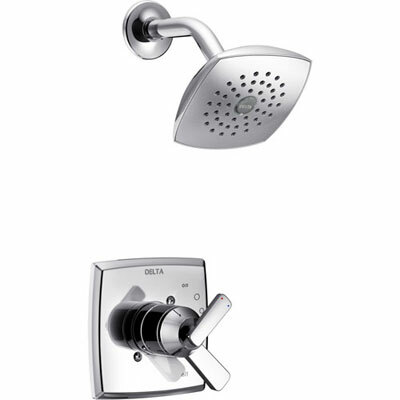 For more information on Delta cartridges read our guide to Delta 17 and 17T series Shower cartridges. Hi Elias, in order to upgrade a pre-2006 Delta shower faucet set you will need to change the rough-in valve inside the wall. Basically, this means your plumber will cut out the existing valve and attach the new valve to your hot and cold water lines inside the wall. 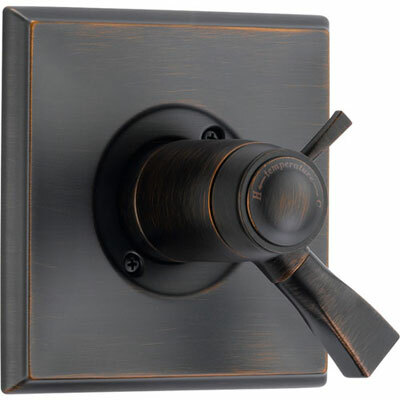 Once you open up the wall to change the valve, you can literally choose any fixture you like. Once you install Delta’s new universal rough-in valve, changing the outer trim kit will be much easier, but for now, since you have the old style valve there is really no easy way to upgrade. Hope this helps, you can always email sales@faucetlist.com with additional questions. Thanks! If I want to upgrade a pre-2006 Delta shower faucet set, spigot, control, and showerhead, what specifically do I need to do? Is there a specific valve I need to purchase before doing this upgrade? Hi Kelly, with regards to your question about the cartridge it’s really impossible to say for sure what the problem is unfortunately. It’s possible the cartridge was installed incorrectly, it’s possible you purchased the wrong cartridge, and it’s also possible it’s simply defective. The best next step for you would be to contact the manufacturer of your shower for help. 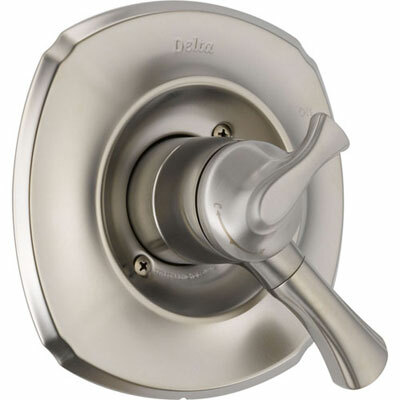 If this is a Delta shower only faucet, you should call them at 1-800-345-DELTA (3358) and they will likely replace the cartridge for free under the product’s lifetime warranty. They can also help you troubleshoot the installation. Their customer service representatives are very helpful and knowledgeable. If you have a different brand of shower faucet, you should find that manufacturer’s contact information online and start there. Most big plumbing brands have very good product warranties and customer service departments. Contacting the manufacturer will probably be the quickest way to solve your issue. Another option would be to call a professional plumber as they will also be a good resource when troubleshooting a problem with your shower cartridge like this. Hope this helps and good luck! Hi Brian, I am not sure exactly what you mean when you said you have a vertical spa. If you can provide more details about your shower and clarify your question a bit I’d be glad to try and help. You can always contact us by email at sales@faucetlist.com Thanks! Hi Sarah, if you have a pre-2006 Delta valve unfortunately you will not be able to install a new Delta trim kit. The change Delta made is actually a good thing going forward, as it makes their valve truly “universal.” The new style valve allows you to use any type of Delta of trim kit because it will fit any Delta cartridge. This means that with the new valve, you can change not only the look of your shower, but also the function without needing to change the valve. However, since your valve was installed before the 2006 cut-off you will have no choice but the change out the valve to the new style if you want to update your trim kit. If your existing shower has some type of problem you might try giving Delta a call to see if they have any solutions so you wouldn’t have to switch everything. I have not heard of any plans from Delta to make additional changes to the valve so it might be worth it to update to the new style valve – especially if you are in the process of some type of bathroom renovation. Sometimes the plumber can access the valve from the backside and not have to rip out the tile. My house was built in 2000, so pre-2006 universal valve. Do all the post 2006 trim kits only fit the universal valve? The only way for me to update my trim kit is to switch out my 2000 valve? 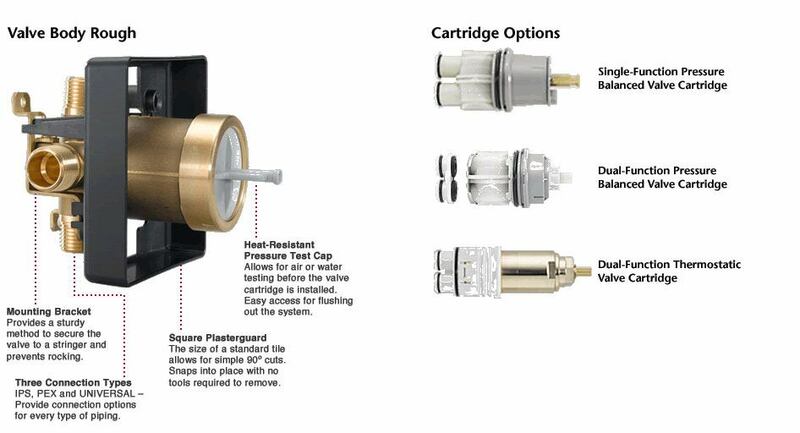 Thankfully, I found this site to explain the differences between the valves and cartridges. 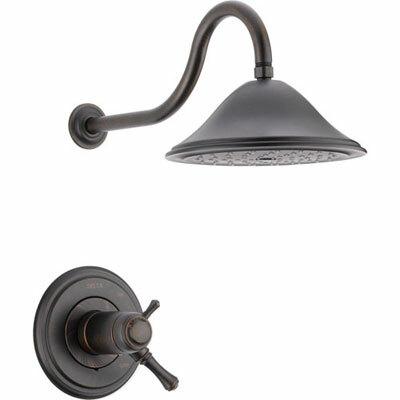 When purchasing the shower or shower/tub trim kits online, there often isn’t any recommendation which to use. Thanks for having this information available! Hi Thays, I appreciate your comment very much as you are 100% correct. Delta made a major change to simplify the way their valve works in 2006. Previously they had more than 1 type of valve ie, the valve was not universal. Now, the new style valve is in fact truly universal. What this basically means is that the valve will work with any Delta trim kit. Whether your trim kit has a 14, 17, or 17T series cartridge, you will be able to use the same valve. Previously things were more complicated as you needed to make sure your particular Delta valve would fit your particular Delta trim kit. It was very difficult to identify exactly which valve you had and which trim you needed to buy. Also, you could not later choose to change to a trim kit with different shower cartridge. If you wanted to upgrade your 14 series pressure balanced shower cartridge to a to a 17T thermostatic shower cartridge, that would not have been possible. So Delta made a change. Now the cartridge is included with the trim kit, as opposed to being included with the valve (which is not true of all manufacturers). Therefore the new style universal valves offer much greater flexibility. Although you are correct that they could decide to change the valve again, it is much less likely as they have now solved many of the challenges that previously existed. The Delta universal valves are very good and it would be unlikely they will make such a major change again any time soon. I do empathize with your situation because your 2005 shower is from right before they made this major change. As time goes forward less and less people will have old style valves. The new valve has a lot of advantages so although changing it is painful now, long term it may be a good option. I am absolutley going to leave your comment here as I think you made a great point that our article failed to mention. We wrote this with the idea that it would be helpful for a new shopper, but you are correct that not everyone reading will be in that situation. If someone else reading this article has an older (pre-2006) valve, I recommend you contact Delta at 1-800-345-DELTA (3358). They are very helpful and will let you know what options you have if you simply cannot change the existing valve to the new style. After reading reviews I would like to recommend that younnclude the issue with newer than 2006 trim kits filtting older than 2006 delta valves. People usually change their trim kits that are 10 years and older. It is misleading to read that all Delta trim kits will fit universal Delta valves. Also, when the valve design changed, in order to really accommodate customers switching trim kits with new model cartridge, delta should have designed a cartridge that fits the older valves and new kits – a conector of some source. I purchased a 17 series trim kit under the assumption that it would fit my 2005 delta faucet – well it did not. Now, if I want to use this trim kit, I need to change the entire valve, which makes things much more complicated. What happens whe Delta decides to change the design of their valves again? Very misleading statement. Hi Roger, unfortunately my only recommendation would be for you to change the shower valve in the wall to the new style. This of course would be a fairly large project and I see why you would try to avoid that. Keep in mind, it might be possible for the plumber to change out the valve from the backside of the shower wall (if there is access). If possible, this can sometimes save you from tearing out the tile. Other than changing the valve entirely, you can try calling Delta to see if they have any parts for your 1970s shower valve. Perhaps they will have some ideas for you about how to repair your existing shower valve. As always, I’d also recommend talking to a licensed plumber. They have probably seen your situation and may have a better idea how to help. .I have a shower tub type that the valve is dripping. It has been in house since 1970s. Delta u.s.pat. 3056418 . The valve Assembly has a round end with a round cap. Do you know what valve assembly I can use without replacing the body unit. It would mean cutting the tub wall unit because it’s sweatted together and hole is not big enough to remove the body unit.I can text you pics. If it would help. Hi Gary, Delta Showers are designed such that the valve is universal, and the cartridge is a part of the trim kit. This is a bit different from other major brands where you often see the cartridge sold as part of the valve. Therefore, if you have a single function cartridge and want to change to a dual function cartridge, you simply need to swap out your Delta trim kit. As you mentioned however, it’s not quite that easy if you have an older style valve. In 2006 Delta made a major design change to their valve so that it would be truly universal going forward. If the shower valve you have in your wall is older than this, you will NOT be able to use a newer style trim kit. If you have an old style valve you will likely have to change out both the trim kit and the valve if you want to upgrade to a dual function cartridge. 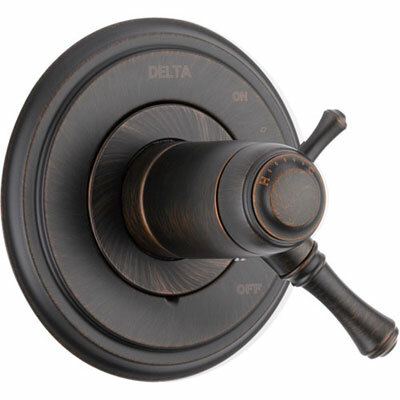 To identify your existing valve the best thing to do is contact Delta Faucet directly. They have a lot of experience and know what exactly to look for to help you identify what you have in your shower. 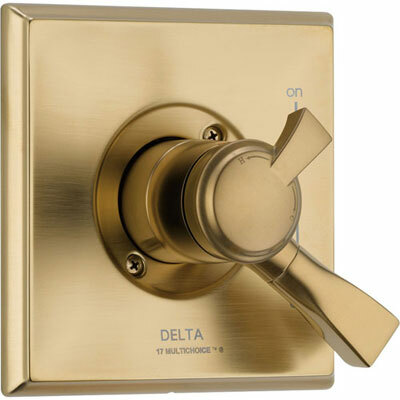 I have a Delta Monitor shower valve. It is a single function valve. Can I replace the cartridge with a dual function valve. I do not know how old the rough in portion is. Is there any way to tell ahead of time or it just trial and error? Thanks for your help. Hi, I have a Delta Lahara 17 monitor shower trim kit and cartridge. If I want to upgrade to a 17t cartridge, do I have to change the rest of the trim kit as well, or will the 17t cartridge fit in the monitor trim? And do I also have to change the shower head? I am trying to increase the water pressure. Will the R10000-UNBXHF High Flow Shower only valve create more water pressure in the shower head then the R10000-UNBX valve. 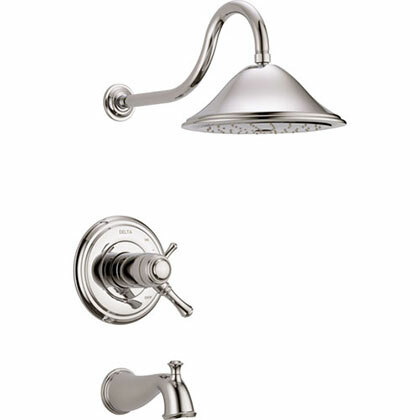 Redoing my master bathroom (which has a tub/shower combo) and am wanting to use the Delta 58471-PK shower head. Which valve and cartridge is best for this application? Hi Danny, glad we could help! Although this stuff isn’t rocket science it definitely can get a little tricky. 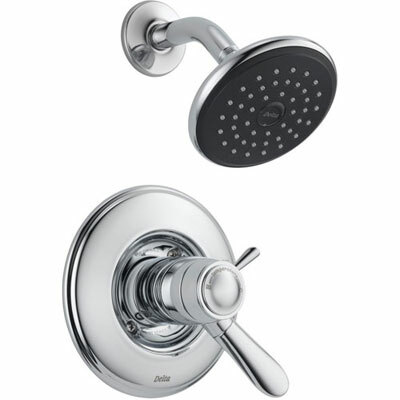 We have so much experience with Delta Shower Faucets that we just want to share that information and help others. If you have any additional questions please feel free to contact us! Thanks again for your nice comment! Just wanted to thank you for writing this explanation about the Delta valve and trim kits for showers and tubs. It has been extremely helpful as I’m just getting ready to do a complete remodel of our master bath. Will a 1700 series upgrade work on a 1400 series faucet? Hi Tamara, “R10000-LBX” is shown on Delta’s website as an item exclusively available from Lowes. After reading through the questions on Delta’s website, it seems this item is identical to the R10000-UNBX but the packaging is different. It definitely is a little confusing but it sounds like the LBX is exactly the same as the UNBX. Hope this helps! I bought the R10000-LBX from Lowe’s. Is that the same as the R10000-UNBX? Can a 10 year old Delta shower valve be used with a new Delta shower kit.